Another hot day. After a vacation that ended up a bit chilly from time to time, I'm okay with it! And vacation - today does not feel like Friday at all! Having a weekend so soon after getting home (Tuesday night) feels like a real bonus! Watch for my next book review coming soon. I'm still turning the book over in my mind. I reall liked it, but I'm not sure what I want to write just yet. Dang. I'm in the mood to go chill (literally) at the theater and see a movie with the kids, but I think our fundage is starting to run a little low for such an elaborate expedition. Hahaha... Why are the movies so expensive?? The next project on my to-do list (besides that book review) is to do all the business reviews I can think of from our vacation, and post them up on Yelp. I can hardly believe summer is half over!! What else do I NEED to do this summer?? 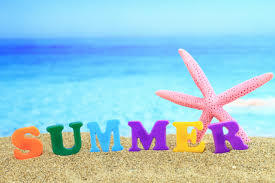 Please tell me what your 'summer isn't real until I ______' activity is!